First the author explains common terms like what is a microbenchmark, measuring throughput versus response time, etc. Surprisingly few sections are devoted solely to statistics and interpretation of inherently varying benchmark results. Oaks goes as far as briefly explaining Student's t-test - important tool in measuring correctness of tests. I found that part very enjoyable (and way too short), but it's just about enough for ordinary purposes. Now it's time to get our hands dirty. Before we start exploring Java performance, author goes through various tool, both available out-of-the-box in JDK and proprietary. A lot is said about different types of profilers - and why they don't show the full picture. JIT (just-in-time) compiler turns out to be one of the most important tools bringing performance to the JVM. First "real" chapter goes into great details of how JIT works in different modes, how to monitor and tune it. I learnt a lot already, but the best is yet to come. Obviously garbage collection is a major concern, thus Oaks devotes two full chapters to explain all popular GC algorithms. Besides pure description, expect strengths and weaknesses of every algorithm as well as unique tuning options. These two chapters are enough to buy this book, but there's plenty more. Further into the book, topics are becoming more high-level. We start with assembly and JIT, through GC, heap and native memory, to reach chapters about threading, thread pools and synchronization. There are many, many examples of proper and broken use of multi-threading, including benchmarks - present throughout whole book as well. We also learn how to monitor and tune threads. Later we learn about somewhat related Java EE topics, including XML parsing performance (expect plenty of SAX/StAX/DOM benchmarks! ), JSON and Java serialization. Also HTTP sessions and servlets are well covered, with amazing benchmarks how bloated session or incorrectly tuned thread pools affect performance. I was really amazed to see how increasing heap can degrade (!) performance. Last chapter, "Java SE API Tips" is surprisingly interesting, with many good advices about collections, streams and lambdas introduced in Java 8, class loading, I/O, etc. I think you see the overall picture by now - we start almost from hardware level to reach JDBC/JPA and JDK level in the end. Similarly to first chapter, still every concept is accompanied with microbenchmark. Because this not-so-long book still manages to cover wide range of subjects, I can honestly recommend it to beginners and more experienced Java developers (the former should probably start reading it from back to front). Some aspects are covered only briefly, but in general it was a very enjoyable and thought-provoking lecture. 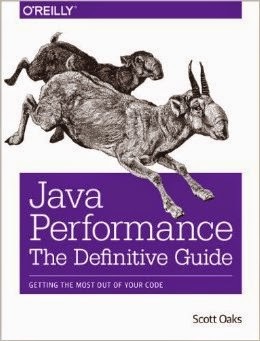 A must buy for every Java developer struggling with performance or lacking understanding of how JVM works. Highly recommended.